Don’t let the thin design fool you. This iPhone 6 plus extended battery case provides more than 14.5 hours of talk time and high-impact protection for your iPhone 6s Plus/6 Plus to keep you connected and equipped for the day ahead. Reliable power in an ultra-thin design. Our thinnest iPhone juice pack yet is perfect for when you need an extra boost to make it through the day. The high-density battery provides over 14.5 hours of extra talk time for your iPhone 6s Plus / 6 Plus to ensure you’re connected when you need it most. Full protection with an ultra-slim design. Rubberized support pads inside of full case protection guards your phone from drops and hard falls. Additional hours. 2,600mAh delivers more than 60% extra iPhone battery life. See additional hours broken down below. High-impact protection. Edge-to-edge protection and built-in rubberized support pads protect your phone from everyday wear and tear. 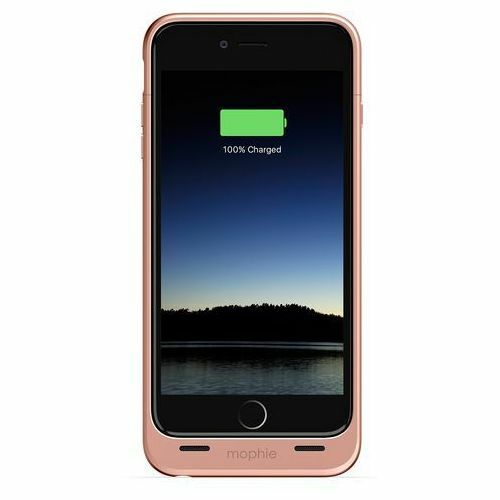 Priority+ Charge & Sync This mophie extended battery case for iPhone 6 plus enables pass-through charge & sync while connected to a computer. Your iPhone 6s Plus/6 Plus recharges first, and then the juice pack case recharges itself. Charge anywhere żeby flipping a switch. Integrated standby switch allows you to choose when to charge or save some juice for when you need it most. The LED power indicator displays the juice pack battery levels and charge status. Know before you go. Reliable, efficient power and industry leading battery life. TRIPLE TEST CERTIFIED Every mophie battery product is tested at three different stages of production to ensure an unmatched capacity, efficiency and build quality along with reliable, long-lasting performance. DIGITAL POWER MANAGEMENT Smart charging circuitry always provides your device with the perfect amount of power for a safe, quick charge. CHARGE VAULT TECHNOLOGY Industry-leading battery life enables our products to hold their charge for an extended period of time, making them more reliable than other battery cases in the market.